Oakley (Oakeley, Oakely), Jeremy, a groom to William III, arrears to, 339. -, Rich[ard], petition of, 116. -, Vincent, loan by, 494. Oates, Rebecca, wife of Titus, annuity or pension to, 164, 448. -, executors of, payment to, 448. O'Brien, [Catherine], royal bounty for, 16. -, regiment of. See Index of SubjectsArmy, Regiments, Foot, . -, lease of, 560, 661, 706. -, lease of, 706. See also Stonehouse, Sir J. -, River, co. Berks, 761. O'Donnell, [Baldearg], payment to, 500. -, John, major, murder of, 771. O'Farrell (Offarrel), [Francis Fergus] d', major general, in the service of the King of Portugal, pay to, 23, 372. Ogilvie, William, riding officer for the wool business, Werden Point, 642. -, request of, to come to England, 431. 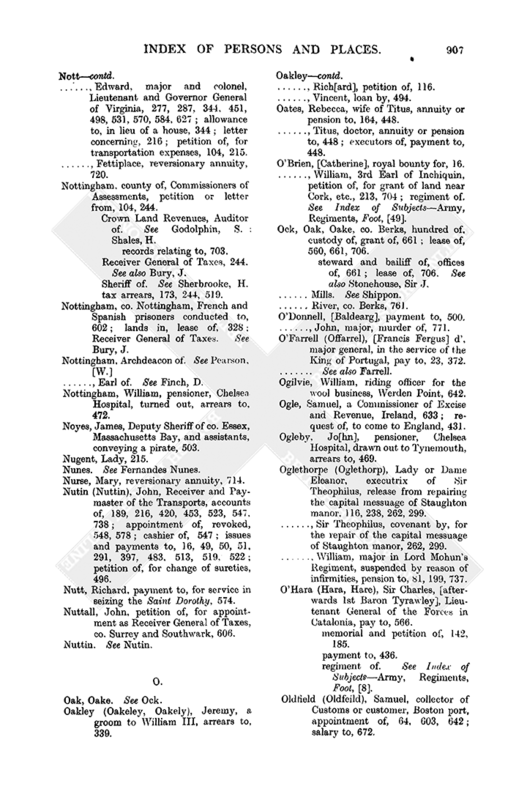 Ogleby, Jo[hn], pensioner, Chelsea Hospital, drawn out to Tynemouth, arrears to, 469. Oglethorpe (Oglethorp), Lady or Dame Eleanor, executrix of Sir Theophilus, release from repairing the capital messuage of Staughton manor, 116, 238, 262, 299. -, Sir Theophilus, covenant by, for the repair of the capital messuage of Staughton manor, 262, 299. -, William, major in Lord Mohun's Regiment, suspended by reason of infirmities, pension to, 81, 199, 737. O'Hara (Hara, Hare), Sir Charles, [afterwards 1st Baron Tyrawley], Lieutenant General of the Forces in Catalonia, pay to, 566.
memorial and petition of, 142, 185.
regiment of. See Index of SubjectsArmy, Regiments, Foot, . Oldys, William, doctor, Queen's Advocate for Prizes, 444, 682. Olive (Ollive), Allen, of Rye, tallow chandler, judgment against, for transporting wool, 105, 531. Onely, [Nicholas], doctor, chaplain of the hospital in the Savoy, 405. -, taxes, deficiencies of, 279. Ongley, Samuel, Sheriff of co. Bedford, 689. Onslow, Abraham, petition of, 116, 187. -, Foot, a Commissioner of Excise and Malt, 655. Orchard, Charles, customer, Exeter port, 603. Ord, [George], captain in Colonel T. Saunderson's Regiment of Marines, company of, 14. -, Hen[ry], senior, tidesman, Newcastle, 701. Orford, Earl of. 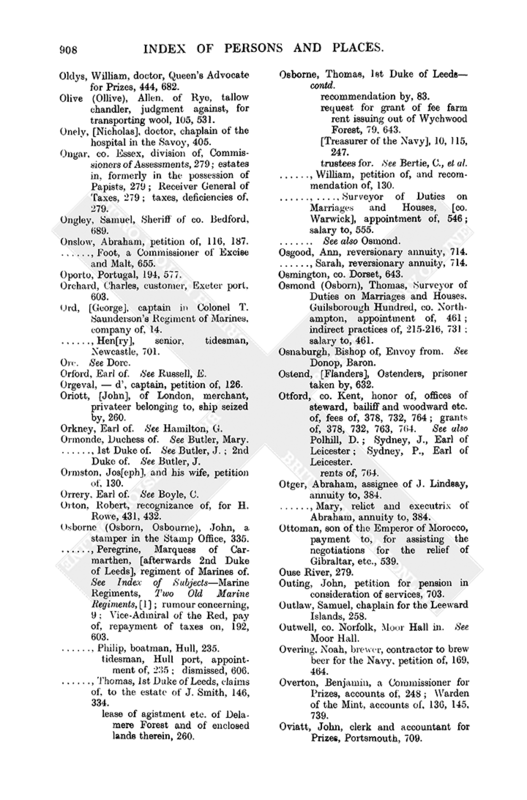 See Russell, E.
Orgeval, d', captain, petition of, 126. Oriott, [John], of London, merchant, privateer belonging to, ship seized by, 260. Orkney, Earl of. See Hamilton, G.
-, 1st Duke of. See Butler, J. -, 2nd Duke of. See Butler, J.
Ormston, Jos[eph], and his wife, petition of, 130. Orrery, Earl of. See Boyle, C.
Orton, Robert, recognizance of, for H. Rowe, 431, 432. Osborne (Osborn, Osbourne), John, a stamper in the Stamp Office, 335. -, Vice-Admiral of the Red, pay of, repayment of taxes on, 192, 603. -, Philip, boatman, Hull, 235. -, Thomas, 1st Duke of Leeds, claims of, to the estate of J. Smith, 146, 334.
lease of agistment etc. of Delamere Forest and of enclosed lands therein, 260.
request for grant of fee farm rent issuing out of Wychwood Forest, 79, 643. [Treasurer of the Navy], 10, 115, 247.
trustees for. See Bertie, C., et al. -, William, petition of, and recommendation of, 130. Osgood, Ann, reversionary annuity, 714. -, Sarah, reversionary annuity, 714. Osnaburgh, Bishop of, Envoy from. See Donop, Baron. Ostend, [Flanders], Ostenders, prisoner taken by, 632. -, grants of, 378, 732, 763, 764. 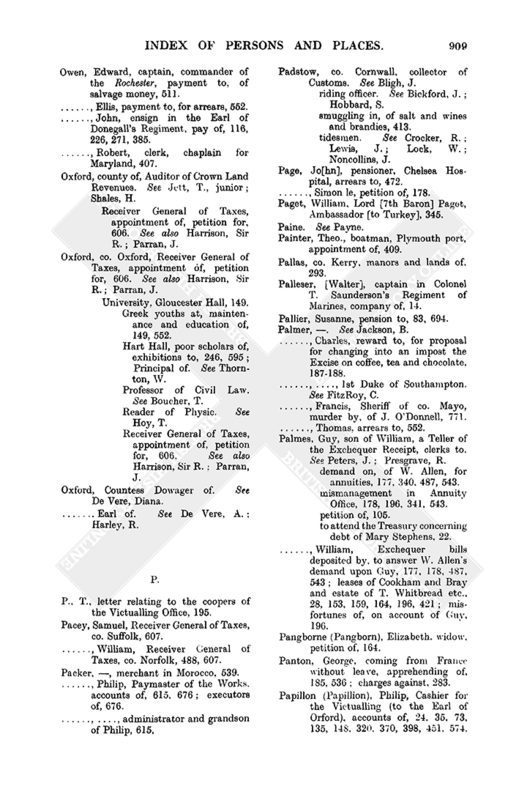 See also Polhill, D.
-, Sydney, P., Earl of Leicester. Otger, Abraham, assignee of J. Lindsay, annuity to, 384. -, Mary, relict and executrix of Abraham, annuity to, 384. Ottoman, son of the Emperor of Morocco, payment to, for assisting the negotiations for the relief of Gibraltar, etc., 539. Outing, John, petition for pension in consideration of services, 703. Outlaw, Samuel, chaplain for the Leeward Islands, 258. Outwell, co. Norfolk, Moor Hall in. See Moor Hall. Overing, Noah, brewer, contractor to brew beer for the Navy, petition of, 169, 464. -, Warden of the Mint, accounts of, 136, 145, 739. Oviatt, John, clerk and accountant for Prizes, Portsmouth, 709. Owen, Edward, captain, commander of the Rochester, payment to, of salvage money, 511. -, Ellis, payment to, for arrears, 552. -, John, ensign in the Earl of Donegall's Regiment, pay of, 116, 226, 271, 385. -, Robert, clerk, chaplain for Maryland, 407. Receiver General of Taxes, appointment of, petition for, 606. See also Harrison, Sir R.
-, co. Oxford, Receiver General of Taxes, appointment of, petition for, 606. See also Harrison, Sir R.
Greek youths at, maintenance and education of, 149, 552. -, Principal of. See Thornton, W.
Professor of Civil Law. See Boucher, T.
Reader of Physic. See Hoy, T.
Oxford, Countess Dowager of. See De Vere, Diana. -, Earl of. See De Vere, A.